Our last Community Clean Up for 2017 was held at Donkey Fields, and in about 90 minutes our 14 volunteers managed to find 13 bags of general rubbish and 15 bags of recycling. While we don’t have enough time or energy to go through the general rubbish, Jon records what recyclables we find so we can see what’s happening on the ground (as it were). This data gives us a glimpse of what the people of Chippenham are imbibing and discarding. In what I believe is a first for Off the Ground / Rubbish Walks, over 50 of one type of litter was found: 51 cans of Carling. At 42 pieces, all of the Coca Cola varieties came in a distant second, followed by Lucozade (39), Monster (34), and Red Bull (22). All this number crunching underscores a serious point. Two actually. First, the sheer quantity of rubbish that would not be recycled if it wasn’t collected by Off the Ground volunteers (and taken to the household recycling centre by Jon!) is staggering. This is just one small patch in one small(ish) town. Can you imagine this multiplied across the entire country? A deposit scheme on recyclable containers would be a step in the right direction towards changing behaviour. Coupled with a strong anti-littering/recycling campaign and educational outreach at all age levels, and we might be able to reverse the tide of litter and the dip in UK recycling rates. If this is too much to ask of the UK government, then the leading brands whose bottles and cans end up strewn throughout our communities need to stand up and be willing to educate their customers. After all, it is their names that are literally being dragged through the mud and the muck. 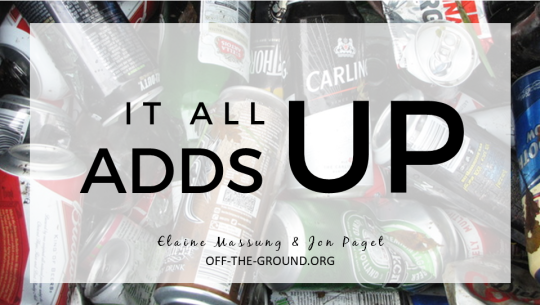 Second, you can learn a lot by recording litter, and the beverages that are being consumed seem to indicate the potential for a continued UK health crisis, whether due to alcohol or obesity. Should more be done to intervene and stop the next generation from making the same mistakes? As we slide towards the end of the year, stay tuned for more information about what’s been found in Chippenham over the past three years and our cumulative total.